A new Hillary Clinton campaign ad hits Donald Trump for saying in 2006 that he hoped the real-estate market would crash because "you could make a lot of money." Then we hear Trump talking about how a bursting of the real-estate bubble would be an opportunity for rich folks like himself. It was caused by the existence of a speculative bubble in the first place. And that bubble was inflated not by Donald Trump, but by the people who have at least in part bankrolled Hillary Clinton’s career: namely, Wall Street banks. In the mid-2000s, a speculative mania swallowed up the real-estate markets largely because Wall Street discovered a new (and often criminally fraudulent) way to peddle mortgage securities. The basic trick involved big banks buying up the risky home loans of subprime borrowers — the loans of people who often lacked verified incomes and had poor credit histories — and repackaging them as highly rated mortgage securities. Basically they took risky loans and presented them as somewhat safer investments to a range of investors, all of whom later got clobbered: pension funds, hedge funds, unions, even Fannie Mae and Freddie Mac. This technique, of turning rancid home loans into a kind of financial hamburger and then selling it off as grade-A beef to institutional investors, created artificial demand in the real-estate markets, which in turn led to the speculative mania. The bubble stayed inflated for a few years because a continual influx of new investors kept the old investors from losing their shirts for a while. The layman’s term for this is a Ponzi scheme. So when Donald Trump in 2006 says, “If there is a bubble burst, you could make a lot of money,” he might sound crass, but he wasn’t wrong. That bubble was always going to burst. Those investors who got creamed were always going to get creamed. We know the names of many of these companies because many of them have agreed to pay huge settlements for their involvement in selling mismarked mortgage securities. Four of them — the aforementioned Citigroup, along with Goldman Sachs, Morgan Stanley, and JP Morgan Chase — are among Hillary Clinton’s top six contributors for her career. The new Clinton ad references people in foreclosure — it even shows a big, scary foreclosure sign. Many of the same banks also agreed to massive settlements for, among other things, using fraudulent documents to kick people out of their houses. Major Clinton donors Citigroup and JP Morgan Chase were signatories to the original $25 billion foreclosure settlement, for instance. As for the whole issue of “rooting” for a crash so as to make money off the misery of others, what Donald Trump was talking about — and it’s galling to the point of being physically painful to have to defend him here — may sound scummy, but was neither illegal nor even unethical, unless you want to call this kind of capitalism unethical (which some might). Trump wasn’t rooting for an avoidable disaster, like a 9/11. With this bubble, the disaster had already happened. The properties were already overvalued. Trump or not, that pain was coming. Taking advantage of market inefficiencies is what investors are supposed to do, a la the traders in The Big Short who spotted the corruption in the real-estate markets early and bet accordingly. Personally I doubt Trump was smart enough to bet so much as a penny out of his alleged billions on the market collapsing, but if he did, it wouldn’t have been unethical, just cold. The same can’t be said for Goldman Sachs, the company famous for paying Hillary Clinton $675,000 for three speeches. In the spring of 2011, the Senate Permanent Subcommittee on Investigations, led by Michigan’s Carl Levin, released a giant report about the way Goldman profited from the crash by shorting the market even as it was advising clients in the opposite direction. This report detailed how in 2006, the same year that Donald Trump was talking out loud about the bubble bursting, Goldman found itself stuck with what amounted to a $6 billion bet on the housing market. But at the end of the year the firm analyzed its position, saw the coming trouble, and realized it needed a change in strategy. 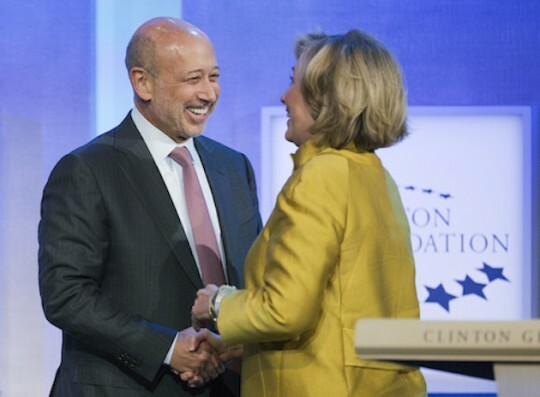 Goldman’s leaders, including CEO Lloyd Blankfein (seen here warmly embracing Hillary Clinton) and CFO David Viniar, decided that they needed to unload as many of their mortgage holdings as possible. This, coming from the chief financial officer of a firm that has been among Hillary Clinton’s top donors, is exactly what Donald Trump said. The difference was, Donald Trump was just talking about making money for himself. Goldman executives were talking about making money at their own clients’ expense. Two months after that Viniar memo, in February of 2007, Blankfein wrote an email of his own. By “cats and dogs,” Blankfein meant the toxic mortgage holdings he wanted off his company’s books. How did they get rid of them? They sold them off to customers. The execs scanned the earth for suckers willing to buy up their doomed products. They found a hedge fund in Australia willing to buy a $100 million mortgage-based deal called Timberwolf, promising returns as high as 60 percent while privately laughing about finding the ultimate sucker. I spent most of the last eight years poring through disgusting stories like this, reporting on the dreary question of what caused the 2008 crash. All of that work was done before Hillary Clinton announced she would run for president. This isn’t about Hillary Clinton for me. It’s about the continuing influence of these companies. These firms have mostly avoided blame for the crisis, partly because this subject is complicated, but also because mainstream politicians from both parties have refused to point a finger at them. For that, Hillary Clinton probably is at fault now, contributing to a failure among major-party politicians to be straight with the public that dates back to the first days of the crisis. It’s bad strategy. Trump is a lunatic, but he’s gaining strength because his supporters believe his story about being so rich that he’s free to tell it like it is. They equally believe his windy diatribes about Beltway pols like Jeb Bush and Hillary being compromised by the great gobs of money they take from corporate donors. By blaming Trump for a problem caused by their own political patrons, Hillary and the Democrats are walking face-first into Trump’s rhetorical buzz-saw. Couldn’t they find something else to hit him with? Find out everything you need to know about the presumptive GOP nominee Donald Trump, in his own words.